On May 29 the staff of the Shedd Aquarium in Chicago welcomed a new member to their aquatic family after Piquet, a Pacific white-sided dolphin, delivered a baby. The calf took its first breath near the surface of the pool where the pregnant mother had been kept segregated from the rest of the dolphins living at the aquarium as the staff watched. On June 12 veterinary staff announced that the baby dolphin was a boy and that both the 24-year-old mother and baby were in good health. It was estimated that the new born dolphin was three feet in length and weighed 25 pounds at birth. The aquarium has kept the pair out of public view because the baby is at risk in the initial few weeks of its life. 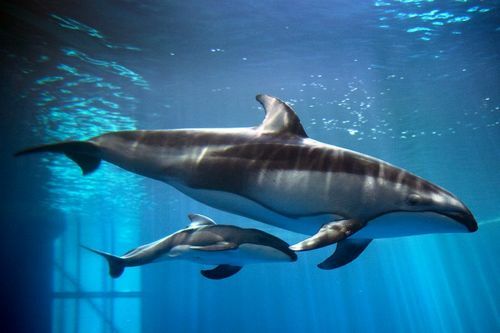 Research has shown that Pacific white-sided dolphin commonly loses its first child during pregnancy or the first year. This has made the aquarium take a cautious approach to the matter and has put the veterinary staff on watch for the time being. On Tuesday, June 12 the aquarium allowed a group of photographers the opportunity to view the mother and calf swimming in their enclosure. The aquarium stated that the dolphin had started nursing it new born a week ago and that he had gained five pounds since birth. Even though these are positive signs, the staff is still keeping the mother and child out of public view as they learn to swim together and also feed. The recent arrival is Piquet’s first child and the mother was pregnant for a year before delivering the calf. A male from the Miami Seaquarium is the father and was brought together with the mother through a breeding program at the aquarium. The 200 pound mother will be going through a critical time as she also learns how to care for her child under the watchful eye of the staff.